With a background in Global Studies, TK Mawuli Azaglo (2011 graduate) founded a non-governmental organization (NGO), Future of Africa. Today, he is both the director of Future of Africa and works as the Associate Dean of Students and Community Affairs at Ashesi University College in Accra, Ghana. 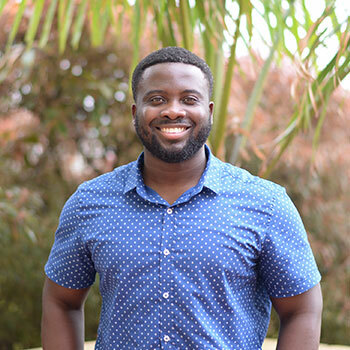 While still at Laurier, Azaglo aimed to make a global difference by founding the Future of Africa in order to protect children and youth on the streets of Accra. The organization holds weekly literacy and feeding programs, provides friendship, and advocates on their behalf. The goal, he says, is to “move these children and youth from the streets of Accra to a school that Future of Africa operates in the Volta Region of Ghana.” With the assistance of a diverse group of 60 young leaders from Ashesi University College, Azaglo facilitates the Future of Africa programs on weekends for about 100 street children and youth. Through their interactions with these children, Azaglo hopes to inspire the students to expand the Future of Africa’s work in their local communities. In addition to his work with students at the NGO, Azaglo is involved further in the university as the individual in charge of Student Affairs. In this wide-ranging position, Azaglo helps and supports students at the university handling anything that falls outside the academic experience. This can entail everything from student orientation to mentoring to student conduct. Going abroad during his third year at Laurier leading a group of seven Laurier students to Uganda for ten weeks was a way for Azaglo to experience the issues he had learned and discussed with fellow students in Global Studies. In the field, injustices came alive, turning from theory into reality and Azaglo saw the opportunity for change. He encourages students not to be afraid to experience life in a community where injustices are taking place. Whether you work abroad or close to home, by looking deeper and engaging in a community, you can be involved in daily issues first-hand. When asked as to how Global Studies helped prepare him for the future, Azaglo highlighted how in his class with Professor Timothy Donais he learned “about local ownership and the idea [of] not going to a community and starting a project without understanding the local context, culture and the realities of the people in that place. Instead, it is important to have a conversation with the locals to figure out what they are doing and address the local problems they experience and work in partnership with them to come up with solutions.” Inspired by the course, Azaglo made the decision to host teams of students from Laurier in Ghana and between 2011 and 2015 seven different teams were able to help with the Future of Africa school. A love for community development grew from his studies in Global Studies but Azaglo also learned that “if you want to see change happen you have to be willing to make some sacrifices.” After returning home to Ghana in 2014, Azaglo was unsure of what steps he would take next in order to invest in his community. Then, from an interaction with a boy living on the street, Azaglo found a way to spend time with street children providing them with friendship, programs, and meals; currently he is hoping to build a community centre as a safe transition space between the streets and the Future of Africa’s school. In a final reflection on his degree, Azaglo notes how his outlook regarding university education changed during his studies. Instead of a place to go to find a job, he feels that “[w]e come [to university] to acquire the tools and skills to think and solve problems.” He advises current and potential students to identify the potential in their communities and create opportunities from within them.